On November 1st, The Secret Mountain launched the “Classic Folk Sing-Along Songs“ Musical Picture Book series, each with a link to streaming musical performances by Montréal based acoustic duo Sin and Swoon. About the singers: Sin and Swoon is a folk-roots band made up of Ottawa Valley native Michael James O’Brien and Antigonish, Nova Scotia’s Michelle Tompkins. They have backed-up several popular Montréal acts, notably Patrick Watson, The Barr Brothers, Plants and Animals, and Thus Owls. 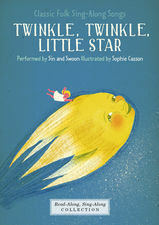 About the illustrator: Sophie Casson studied graphic design at the Université du Québec à Montréal. She was a finalist for the 2011 Governor General’s Award and has won many awards both in Canada and the United States. Her illustrations have appeared in a wide range of magazines including Business Week, The New York Times, Canadian Business and The Globe and Mail. She recently exhibited her work at the International Design House Exhibition in Taipei, Taiwan. About The Secret Mountain: Award-winning stories and music for all eyes and ears. The Secret Mountain is a Montreal, Quebec company that is dedicated to creating quality children’s books, videos and audio recordings. I love their pairing of books with music that adds to the quality of a child’s learning. Check out their English (also available in French) titles and store here.